Former California Gov. 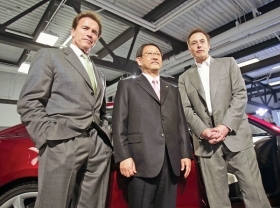 Arnold Schwarzenegger, Toyota President Akio Toyoda and Tesla CEO Elon Musk announced the Toyota-Tesla deal in 2010. LOS ANGELES -- When Akio Toyoda and Elon Musk shook hands during dinner at Musk's Bel Air, Calif., mansion in May 2010, there were big grins all around. The two had just agreed that their companies would co-develop an electric vehicle ... but they had overlooked an important detail: Which company would be in charge of the project, Toyota Motor Corp. or tiny Tesla Motors? When top execs make bold moves over dinner and drinks, critical matters can get ignored. As Toyoda's decision to build an electric version of the Toyota RAV4 cascaded down through Toyota's and Tesla's r&d and engineering ranks, a series of questions arose, some of which threatened to wreck the project. Toyota built an electric version of the RAV4 on its own in the 1990s. But this would be a whole different level of complexity: unproven lithium ion battery chemistry new to Toyota, with lofty performance and stringent vehicle-crash specifications. And it would be done in partnership with a small automaker that had a vastly different operating style. Add to that a tough timetable: from idea to market in just 20 months. Despite the hurdles, some of which boiled down to a simple matter of trust, Toyota and Tesla were able to take an electric car from concept to Job 1 on time. Tesla is producing the motor and battery pack at its Fremont, Calif., factory. Final assembly began this month at Toyota's Woodstock, Ontario, plant. "Our motto became 'Fast and Flexible,' which is totally different from typical Toyota," said Greg Bernas, the RAV4 EV's chief engineer. "There were things we did on this vehicle that had I tried them on a Sienna or Venza, I would have been told, 'No way,'" Bernas said. "This was the most difficult program I've ever been a part of." First they had to figure out which company was in charge. At the beginning, each assumed it was the other. Toyota engineers thought it must be Musk's company, because the CEO's tiny startup was bringing new lithium ion battery technology to Toyota's existing vehicle platform. Tesla, already shy of resources in its scramble to bring its Model S sedan to market, assumed that its batteries would be plug-and-play into the vehicle, and that Toyota would handle the integration and management of the system. "We were moving at warp speed," said Diarmuid O'Connell, Tesla Motors' vice president of business development. "There was a bit of two quite different worlds meeting." Much of Toyota's electrical engineering expertise resided in Japan and could be called upon during development. But speed was essential, so Akio Toyoda, Toyota president, decided all project management would be handled in the United States. He knew the traditional Japanese r&d setup was too hidebound to work well with Tesla. Toyoda went to Shigeki Terashi, then head of Toyota's U.S. engineering operations, and told him the project was his. Terashi quickly named Bernas chief engineer of the project. Bernas, a 20-year Toyota veteran with a taste for chewing tobacco and outdoor sports, was chief engineer of the Venza crossover developed in the United States. So Toyota was in charge, but a new series of questions emerged. If Toyota was dictating content and setting specifications, what was Tesla's role? Was it a partner or a supplier? How much collaboration was to be expected if, basically, Toyota was buying a commodity? "There was some suspicion at Tesla that we were going to walk away with their battery technology and say, 'We don't need you anymore,'" Bernas said. "But Toyota has its own proprietary processes that have taken decades to build and that we didn't want to disclose." Tesla's O'Connell said: "We always thought of ourselves as a co-equal partner. In the Toyota context, there is a very precise strategy for supplier management. It was challenging for folks steeped in that tradition to look at tiny little Tesla as a co-equal partner. "The question was how to keep our intellectual property segregated from one another so we could protect our assets while creating as much opportunity for improvement in final product as possible," O'Connell said. To settle the intellectual property issue, Toyota agreed to provide a spec book that listed the specifications of parts the RAV4 EV required. Tesla would build to those specs. But even that system posed problems. Some of Toyota's specifications meant major changes to Tesla components -- hardly plug and play. Tesla didn't have the engineering resources to make those changes and achieve Toyota quality levels, especially while cramming to get its own Model S sedan to market. Tesla informed Toyota that it would build parts as best it could, but those parts might not be to Toyota specs. Toyota engineers said that was unacceptable. They wouldn't buy the parts if those parts didn't measure up. After some negotiations, the two sides came up with an idea: so-called no-notebook meetings. The two r&d teams would perform design-for-failure testing and then analyze problem parts to determine the cause of the failure. Toyota shared its engineering resources and Tesla was able to hit the specs. But to protect intellectual property, no handwritten or laptop notes could be taken during the sessions. There also was the problem of developing the EV based on an old platform. In fact, a redesigned RAV4 with a new platform was scheduled to be launched at about the same time the EV would arrive. It would not be possible to develop an EV concurrently with the new RAV4 platform. And the parties could not wait for the new model to be completed before starting r&d and still meet Toyoda's tight deadline, Bernas said. The old platform would have to do. Once the big-picture issues were solved, there were details to consider. One involved the vehicle's range. Some engineers wanted longer range, but that would mean a larger battery and longer charging times, said Hidetoshi Kusumi, Toyota executive powertrain engineer. "For 150 miles of real-world range, the expectation for a [240-volt] charging time was 10 hours. It would have required a new charging system, and that would have added time, and we didn't have that," Kusumi said. Both sides agreed that a real-world range of 100 miles would be sufficient. Toyota and Tesla also had different ideas on precisely how the vehicle should function, said Sheldon Brown, Toyota's executive program manager for the RAV4 EV. For instance, if a driver were climbing a steep grade on a hot day, what would take precedence? Keeping the battery pack chilled (and reducing the flow of cool air to the cabin), or keeping the passengers cool (and reducing the battery's power output)? Both sides agreed to put a priority on keeping the cabin cool until there was an actual battery emergency, Brown said. But those settings brought yet another question: How should the car warn the driver about the compromises being made? "It was the difference between gradually breaking bad news or waiting until something bad is going to happen," Brown said. Toyota engineers often were taken aback by Tesla's on-the-fly development process. "Tesla did zero component testing. They just test the whole vehicle at once and troubleshoot it," Bernas said. But sometimes Tesla's ready-fire-aim methodology came to the rescue. During cold-weather testing in Alaska, the prototype vehicle vibrated strangely when running on the slick roads. Toyota engineers were baffled, but Tesla software engineers were able to reprogram the traction control algorithms seven times in one afternoon until the vibration was eliminated, Bernas said. As project leader, Toyota occasionally overruled Tesla. One clash came over the feel of regenerative braking while the car was coasting with the driver's foot on neither the accelerator nor the brake pedal. Tesla wanted a sudden slow-down response, which would return more energy to the battery, while Toyota wanted a less abrupt response. Because Toyota owners are accustomed to the Prius' gentle gliding when the driver's foot leaves the accelerator, Toyota engineers felt it would be a mistake to contradict the user's expectation of how a green Toyota vehicle should feel. Still, Toyota did some testing of a grabbier regenerative braking profile last year at an environmental conference in Torrey Pines, Calif. Drivers were split 50-50 on the prototype's response, but back-seat occupants hated the neck-snapping feel of the stiffer regenerative setting, Brown said. Toyota had the data it needed to make its case. At one point, more than 100 Toyota engineers were involved in the project in some capacity, with about 30 working on it full-time. Tesla declined to say how many were dedicated to the project. Would Toyota and Tesla work together again? O'Connell said he liked the esprit de corps the joint venture created. He also admitted that Tesla learned many mass-production tactics from its partner -- a whole new world for a company whose manufacturing experience had consisted of several hundred Roadsters hand-built with Lotus Cars. The lessons learned with RAV4 EV production engineering have filtered down to Tesla's far more commercially critical Model S, O'Connell said. Production started in June. Bernas said the teams were able to collaborate and compromise on many solutions. That reflected Akio Toyoda's vision, avoiding the use of a traditional Japanese chief engineer -- with much stricter processes -- who might have drawn a line in the sand on a critical detail. "This may become the model for low-volume future Toyota products," Bernas said. Only half-joking, he added: "With the methodical Japanese method, this vehicle would never have come out."